The UN Security Council has imposed an arms embargo against the Houthi rebels in Yemen and blacklisted the son of Yemen's former president and a Houthi leader. 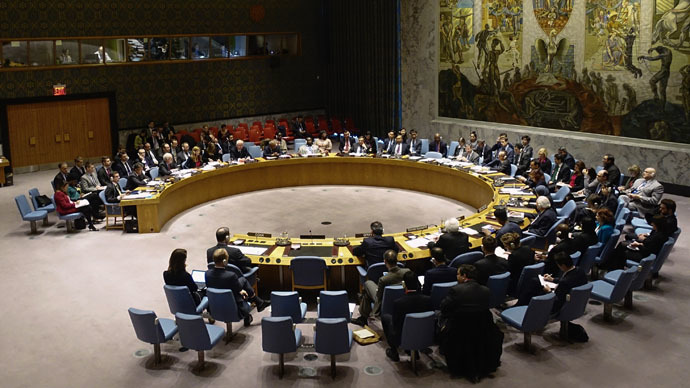 Fourteen members of the Security Council voted in favor of the resolution, Russia being the only abstention. The Russian representative explained the move by saying that not all of Moscow’s proposals had been included in the final text drafted by Jordan and Gulf Arab states. "The co-sponsors refused to include the requirements insisted upon by Russia addressed to all sides to the conflict to swiftly halt fire and to begin peace talks," Russian UN Ambassador Vitaly Churkin told the council after the vote. The resolution also blacklisted Houthi leader Abdel-Malek al-Houthi, as well as the son of Yemen's former president, Ali Abdullah Saleh. The Jordanian draft resolution was being debated alongside a separate Russian draft, which called for a “humanitarian pause” in airstrikes by the Saudi-led military coalition. An all-inclusive arms embargo on all parties in the Yemeni conflict, suggested earlier by Russia as an amendment to the Arab draft, was rejected. "We insisted that the arms embargo needs to be comprehensive; it's well known that Yemen is awash in weapons," Churkin said. "The adopted resolution should not be used for further escalation of the armed conflict." The Shiite Houthi rebels took control of Yemen’s capital, Sanaa, in September 2014, forcing President Abd-Rabbu Mansour Hadi to flee to Saudi Arabia. They are now fighting for the strategic port city of Aden. The Houthi offensive is supported by soldiers loyal to Saleh, who was forced to give up power in Yemen after a 33-year rule in 2012. Saudi Arabia and its Sunni Arab allies have been bombing the Houthi rebels since March 25, with over 1,000 people killed since the start of the conflict. Al-Houthi and the ex-president’s eldest son, Ahmed Ali Abdullah Saleh, will face an asset freeze and travel ban in accordance with the sanctions. Last November, UNSC imposed the similar sanctions on former President Saleh, the rebel group’s military commander Abd al-Khaliq al-Houthi and the Houthi’s second-in-command, Abdullah Yahya al Hakim. The resolution also urged “Member States, in particular States neighboring Yemen, to inspect ... all cargo to Yemen” if they have reasonable grounds to believe it contains weapons. The document demanded all Yemeni parties to stop fighting, especially the Houthis, who are called upon to withdraw from Sanaa and other areas they have seized. It also blamed ex-President Saleh for "destabilizing actions" in Yemen, including supporting the Houthi uprising. Following the arms embargo by the Security Council, the US Treasury Department announced unilateral sanctions against Yemeni rebel leader al-Houthi and the former head of Yemen's Republican Guard, Ahmed Saleh. The governing body said it “calls on the masses of the Yemeni people to rally and protest on Thursday to condemn the Security Council resolution in support of the aggression,” local television reported.